If you’re a Traffic Exchange Surfer and/or Safelist and Mailer user, then you’ll definitely want to read on. To start with there are a couple of sites I have been exploring that give you free stuff using promo codes you can use to advertise your programs. 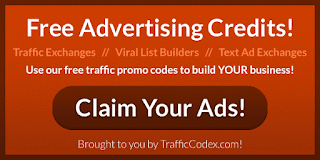 Check these out asap, Traffic Codex, Free TE Credits, and Truck Loads of Ads. Traffic exchange promo codes are smart ways to save you money and get people to look at your advertising. Every smart marketer knows that they need lots potential customers viewing their websites to be successful. 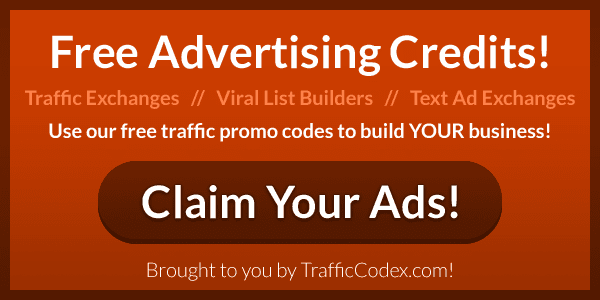 Traffic Codex is a Free To Join Traffic Exchange Directory filled with TONS of Free Promo Codes just waiting to be redeemed by you for free advertising! Then there is Free TE Credits, a wonderful free to join program with a unique ranking system, as well as lots of tools, e-books, resources and so much more! Eric Goettman also owns this site PTC Professor which I am exploring. The last program I found is Truckload Of Ads, where for a small one time fee of just ten bucks gets you lifetime access to a huge amount of Exclusive Free Traffic Exchange Promo Codes for your favorite Traffic Exchanges and Mailers. As you will find out these programs offer you a lot of perks for free or for a small fee you can upgrade and get more tools and opportunities to earn commissions. I hope you enjoyed this and as an added incentive, if you join any of the above programs with me, send me a quick note I will give you 5,000 credits at Instant Traffic List, if you join all three I will give you 10,000, and if you upgrade in any of the three, you tell me what you want. MXRevShare and BuildABiz work for me.